Stafford Gatehouse are buzzing about Phyl's new show! 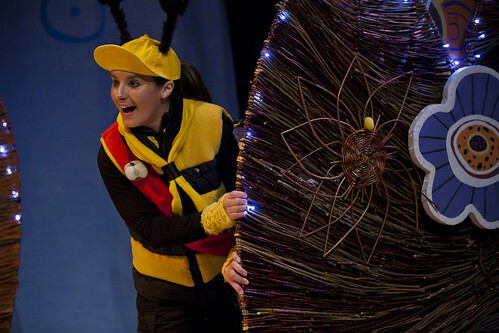 Director and actor Phylip Harries makes a welcome return to the Stafford Gatehouse Theatre on May 28th when Theatr na nÓg's production of 'We Need Bees' makes a buzzing visit. The production especially for children and families is currently on an eight week UK tour, and for one day only, performs at the Gatehouse.
' We are now coming into our fourth week and as we get deeper into the tour we are going further and further from home, going to such places as London and Dundee which I'm very looking forward to as I've never ventured to Scotland before. We do have a nice week off before we go up... to Scotland then we are away for three weeks, so for a mummy's boy it will be difficult thank god for face time haha!
' 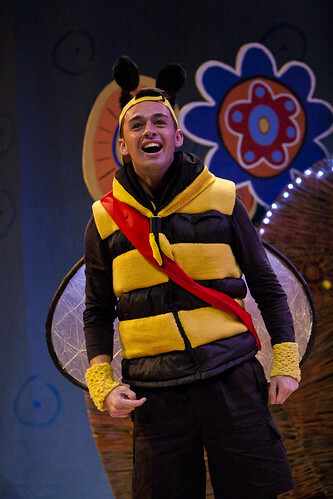 I really enjoy playing my character Bertie as we are quite similar, apart from the fact he's a honey bee of course, because I only ever wanted to do one thing in school and that was be in the drama block performing or even being the class clown in other subjects, so it wasn't to hard to find how to play him!
' It is a long old tour and its different from day to day as we could have a long travel a get in, then a show and also a get out, but I like to keep everyone on their toes by winding them up, and by being the youngest in the group, I can get away with it a bit more haha. 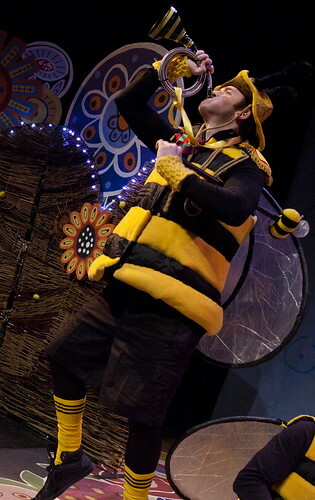 We interview Aled Herbert ..... who plays Beelko, Blue, Woody and Crab Spider in 'We Need Bees' ....... do you have a question for Aled? If so, send in a question and Aled will gladly answer it!
' The tour has gone really well, we have visited some lovely places and the welcome from everyone has been amazing. I know we are all looking forward to visiting Scotland and performing to sell out crowds. 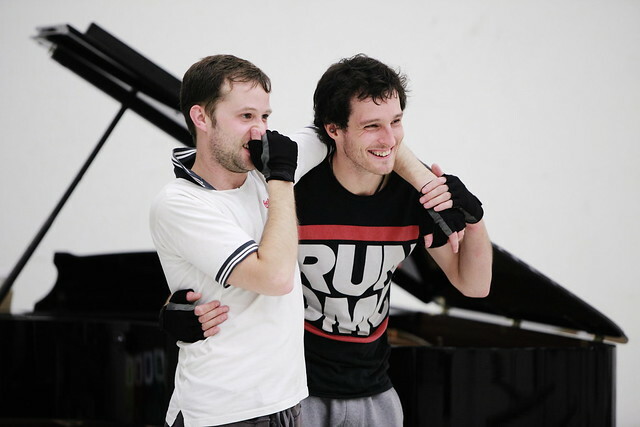 What is the best thing about your character - you play several in this colourful production? It's an eight week tour, are the bees getting tired? Fe wnaethon ni holi Non Haf am ei phrofiadau fel y wenynen gyfrifol yn y sioe ' Gwobr y Gwenyn Gwerthfawr', a dyma beth oedd ganddi i'w ddweud ..... a oes gyda chi gwestiwn i un o'n actorion? Shwt mae'n mynd mor belled? 2: Beth yw'r peth gorau am eich cymeriad?
' Mae Bron yn chwareus iawn, ac mae na lawer o hwyl yn y sioe. Mae ei pherthynas gyda Byrti yn hyfryd - mi wnawn nhw unrhywbeth i'w gilydd! Ond Bron yn bendant ydi'r bos!! 3: Mae'n daith hir yn wyth wythnos o hyd - ydy'r gwenyn wedi blino? 4: Beth sydd orau gyda ti am dy gymeriad? A'r peth gwaethaf? This will be our second visit here, and even though it will be a 4 hour 23 minute trip (google it) taking in nigh on 300 miles, we are so pleased to be making this journey, because it is so encouraging for us, a little known company from Wales, performing at one of the most respected theatres in the UK (It won the Most Welcoming Theatre of 2012 TMA Award), and to play to a packed house! Oh and by the way it would take a bee 20 hours to get from Neath to Ipswich! So - Lets Get ready to Bumble! Theatr na nÓg goes live! It's vibrant and colourful and illustrates the exciting work of the company. Today, (Monday, 15th of April) Theatr na nÓg's new website goes live! 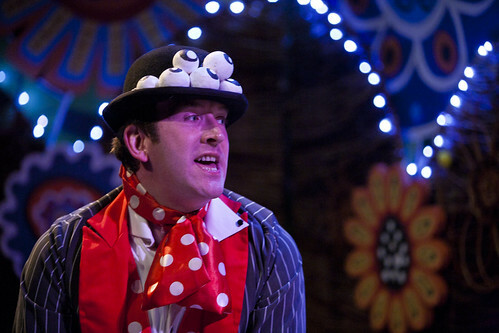 www.theatrnanog.co.uk. It is this natural evolution that saw the Company rebrand, and with a new logo and new website, Theatr na nÓg aims to attract new audiences to its work.